Here is a picture of Gary Bodeau, Deputy of Delmas. 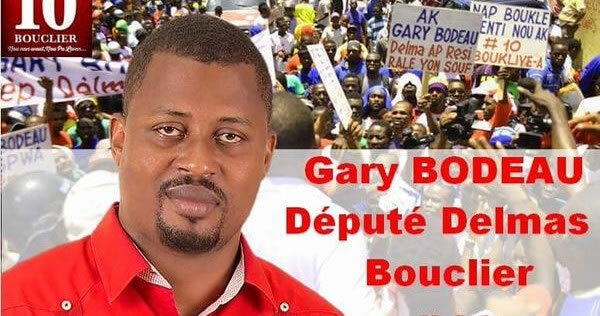 On February 14, 2016, despite his opposition to the candidacy of Senator Privert as the Interim President, Gary Bodeau, Deputy of Delmas asked the Interim President, together with Parliament, to give the country a consensus government, headed by a competent, honest and dynamic Prime Minister who should be supported by over 15 ministers and three secretaries of state which to be selected from the bodies of politicians and / or civil societies. Although Bodeau saluted Privert's coming to power, he was of opinion that Privert's accession to the presidency of parliamentary office was in contravention to the principle of separation of powers, against Articles 60 and 60.1 of the constitution. He requested his parliamentary colleagues to respect political ethics and have respect for the constitution of the country.